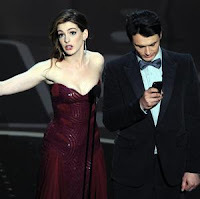 "Can’t say the same about the hosts, who were really a host, namely Anne Hathaway. She gamely soldiered along while James Franco did, um, what exactly? Mr. Franco tweeted about doing the Oscars, made movies about doing the Oscars, gave many interviews about being a host, but when it came time to do the actual Oscars, he entered the witness protection program." It became obvious after about five minutes that while she was light and bubbly and the apparent master fixer of awkward silences, he was stiff, uncomfortable, and seemed as if he'd be happier out mountain climbing, preferably without getting his arm stuck in a rock, but not necessarily. Speaking of arms, it was painful to watch her try to cozy up to him and put her arms around him, only to see him standing practically with his back to her and looking off into some faraway horizon. Even transgender costumes and awkward musical numbers couldn't save these two, and clearly, no one was buying in. And it wasn't only about the hosts-- we had the winning actors, producers, and directors, scoring big points as usual when they were clever, witty, and succinct, and conversely, causing ennui and discomfort when they exceeded their boundaries and went on and on, past their allotted time and stretching the edges of relevancy. In this age of social media and quick messaging, we become irrelevant when we take more than one minute to say anything, even at the Oscars. Other awkward moments included Jennifer Hudson looking as if this were the first time she'd seen her cue cards, and the finale sing-a-long (or not) from the fifth-grade chorus from P.S. 22 in Staten Island singing “Over the Rainbow.” This seemed odd to me. Why American Idolize the Oscars, and why be so painfully obvious about trying to bring younger viewers in? If you really want to build a bridge between the arts and future generations, how about highlighting a movie made by teens that would resonate to large audiences. There's a medium specifically for that these days-- I believe it's called "YouTube." Please feel free to comment here. What were your thoughts on the Oscars, and do you think they represent any business or life lessons?